A hit tip to Yukon Sully (who tips his hat to Myrna the Minx) for pointing out this article about the latest incarnation of the ever-changing plans for the Reno Hilton. A development company is working on buying the place and converting it into condos, just like so, so, so many other hotels in Reno. 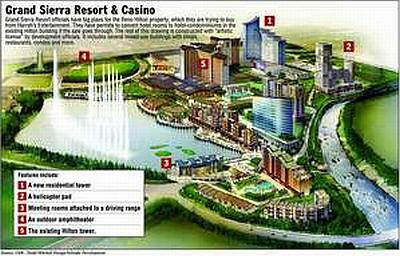 But this new property, to be christened the “Grand Sierra Resort”, will be so much more than just condos. Restaurants, shopping, outdoor entertainment, water parks, fountains, and a pile of other yet-to-be-announced ideas (the designer prides himself on changing his mind often) will be part of the final package, when and if it ever gets built. The sale hasn’t even gone through yet, but they’re already taking $10,000 deposits from interested buyers, so at least the place will be partly occupied. The Reno Hilton opened in 1978 as the MGM Grand, at the time the largest hotel/casino in the world. It went through a short stint under the Bally’s name in the late 1980s before becoming the Reno Hilton. It’s already a pretty impressive place, with a huge casino floor, several restaurants, a large showroom, gigantic conference center, a wedding chapel, video game arcade, shopping mall, bowling alley, and movie theater, all under one roof. I’m guessing most of that will be kept, or enhanced, as a way to bring in visitors. If any of this gets built at all. The designer, Dodd Mitchell, comes across in the article as one of those flaky artists who will get bored with the whole thing before it’s done. He’ll move on to something else, and sales will be below projections, and they’ll be lucky if they finish converting the tower that’s there now, much less building anything new. But I’m getting ahead of myself. I shouldn’t be pessimistic until it actually fails.